Wired.com: I think people were really interested to know, are they going to release Mario and Metroid and Zelda all in one year? Dunaway: And you said we wouldn’t. You bet no, right? Wired.com: I bet no. Are you going to hold me to that? Do I owe you a steak dinner? Dunaway: I think you do. Wired.com: I’m happy to lose that bet. Those are the kind of bets that I try to make. 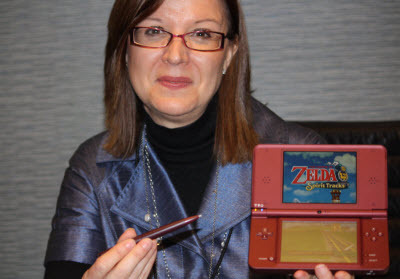 Cammie Dunaway is Nintendo of America’s executive vice president of sales and marketing, so what she says holds almost as much weight as Reggie Fis-Aime. In either case, here she is openly making a bet on the very subject. She seems extremely confident, don’t you think? Check out the rest of the interview at Wired.com. In other news, GoNintendo reports that Dunaway also stated that Spirit Tracks cracked 4.5 million in sales, based off this interview. Further inspection shows that this is indeed incorrect. The 4.5 million+ remark pertained to Super Mario Bros. Wii alone. According to VGChartz, Spirit Tracks is sitting around 2 million or so in global sales.